Another vintage German gnome, this one is a bit later than those previously posted, made in West Germany in the 1950s or '60s. 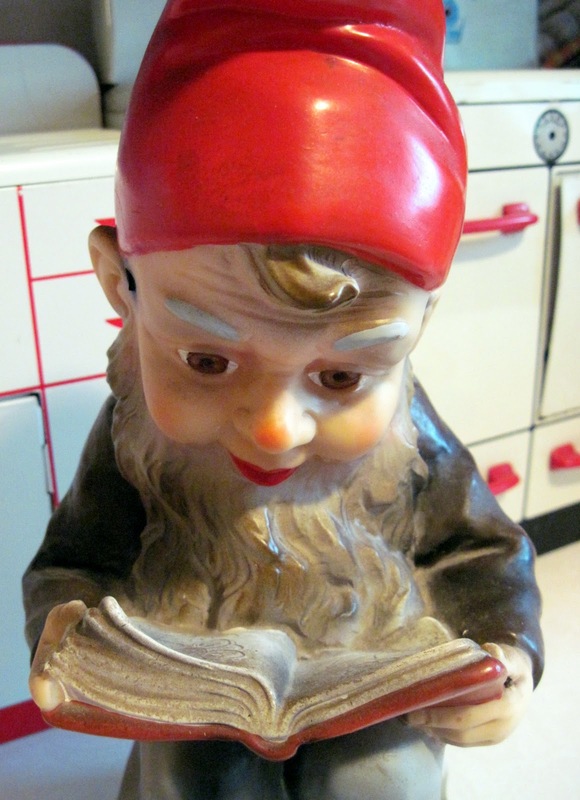 Manufactured in high quality vinyl by Heissner, one of the oldest German gnome makers, this reading gnome measures 13 inches tall to the tip of his hat. He's very appropriately reading a gardening book. What a fabulous face, such a look of wonderment. Whys is there a blue 'thing' growing out of his temple? Hmmmm...I'm not sure! It looks to me like some bit of airbrushing that missed its mark, but I'll take a closer look at him when I get home tonight, and report back with my findings. 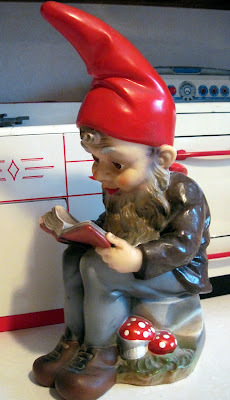 I have a Heissner Gnome too. You would be horrified though. He actually lives in the garden tear round, so he doesn't look nearly as nice as yours. I was under the impression that garden gnomes belonged in the garden, but it seems they would actually prefer to be in the living room. Tracy - I have been looking for a little gnome just like that! Are you interested in selling him? My mother recently passed away --- She kept two gnomes just like the one you found on our mantle. She often spoke to me about having one and had them on a list she made for me. However, a new list was created - a simple and unfinished one. 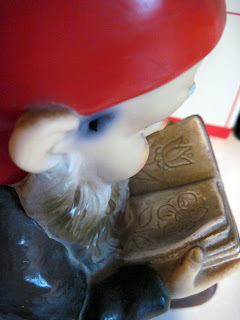 The gnomes were not designated to me or anyone on the new list. It ended up that one of my sisters took the two gnomes. I have been looking for another - for even if they are not my mother's, having one just like hers would mean the world to me. oh, I hope you aren't too attached to him, yet.